It takes guts to pull the plug on your labor of love at the height of its success. That’s just what Christopher Fritton and Kevin Thurston are doing this week, when the Buffalo Small Press Book Fair has its 10th and final iteration in the Karpeles Manuscript Museum and Library on Porter Avenue from 12 to 6 p.m. April 9 and 11 a.m. to 5 p.m. April 10. From the moment it debuted, the fair was an unqualified success. It drew together reclusive artists who created handmade books, under-the-radar presses that printed slim volumes of poetry and printers who used old-school techniques to churn out large-scale posters and screen-printed postcards. Its modest inaugural version, which featured 65 vendors and about 1,000 visitors, eventually blossomed into a four-day event replete with readings and ancillary programming that last year drew about 150 vendors and between 5,000 and 6,000 people. More than any other project aside from perhaps the Buffalo Infringement Festival, it demonstrated the overlooked and unacknowledged depth of the area’s burbling creative underground, whose members were just waiting for the right opportunity to connect with the public. In Fritton and Thurston’s eyes, the Buffalo Small Press Book Fair was the right opportunity at the right time. But after 10 years, with concerns about stodginess dogging its forward-looking founders, they’ve decided to close the book. And they’re doing it as a kind of pre-emptive strike against the creeping irrelevance that sometimes plagues older organizations. The move also comes amid the seemingly irrepressible rise of print-on-demand publishing during the last decade, which meant that most applications the fair now receives come from self-published authors looking to sell mystery or romance novels. Fritton, who spearheaded the fair for the majority of its life after Thurston left the area (he returned last year), is an incurably restless soul. He has spent the last year and a half on the road, visiting print shops across North America as part of his ongoing “Itinerant Printer” project, which he hopes to expand into an international tour. And faced with the prospect of retooling the fair for a growing and changing audience while simultaneously following their own artistic pursuits, Fritton and Thurston thought it best to go out a high note. “I wanted to end it on my own terms, and I wanted to really take a step back because the city is changing so much,” Fritton said, adding that it’s possible some version of a similar fair might return in the future, but not under the banner of the Small Press Book Fair. 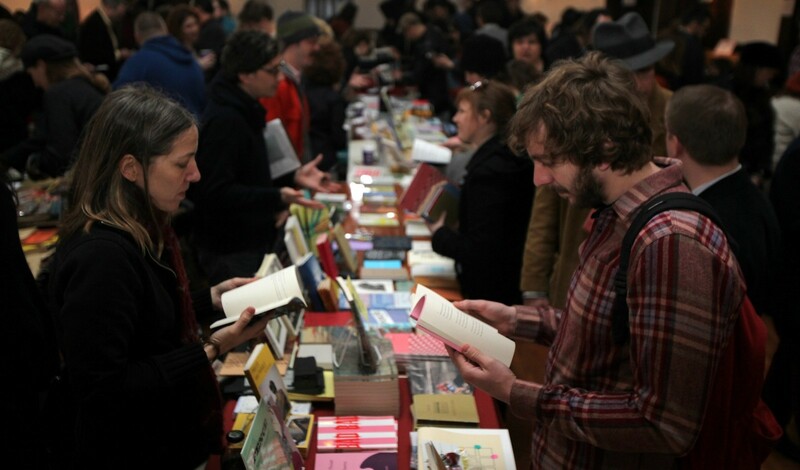 During its decadelong run, the Small Press Book Fair made an outsized impact on the city’s cultural community. For Geoffrey Gatza, the editor and publisher of the local press BlazeVox Books, the fair was a highlight of the year – an opportunity for poets and printers to emerge from a winter of sometimes solitary creative activity and to sell their wares. “Or more likely, give them away,” Gatza said. The same goes for Caitlin Cass, a comics artist who first participated in the fair six years ago after moving to Buffalo for graduate school. She has been a fixture at the fair ever since, drawn back year after year by the uncommonly diverse group of artists, poets and creative people who populate the event. Beyond the community-building aspect of the fair, it’s also been an economic boon for Gatza, Cass and countless other artists and organizations from Buffalo and far beyond, who sell at their highest volume during book fair weekend. Cass, who creates comics for a group of subscribers throughout the United States, estimates that a full third of her audience is a direct result of the fair. For Fritton, who will head out on the road again in the fall after compiling a book based on his “Itinerant Printer” project, the event represented an important moment in Buffalo’s rapidly evolving culture. The consensus from creators and participants is that it was the perfect event for the perfect moment, a bright, brief flash of opportunity for a community that desperately needed it. The island that Fritton and Thurston built may be disappearing, but the canoes are still here. As Buffalo’s creative community continues to thrive and change, in part thanks to their work, those canoes are now in search of a new place to dock.